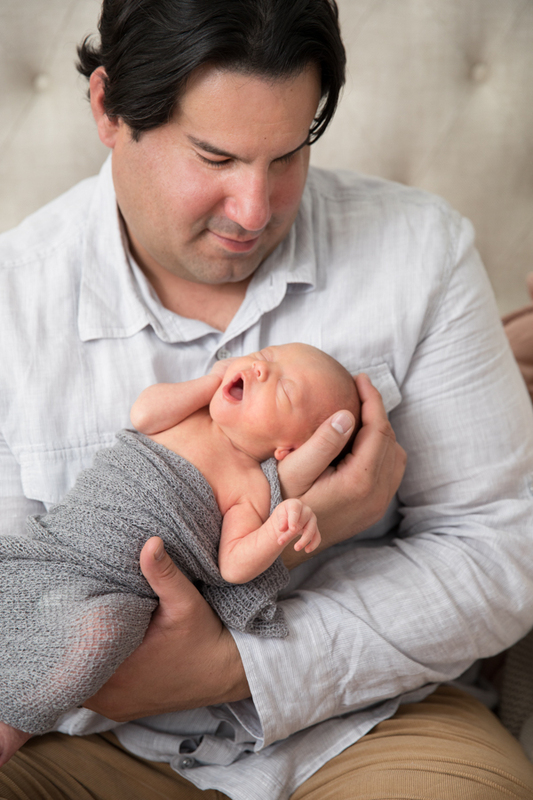 In their cozy of Back Bay home, we met Shannon, her husband Daryl, and their newborn twins for a truly special photoshoot. The twins had come earlier than planned, and were just 5 lbs each. But as the saying goes, good things come in small packages. We started out the photoshoot in the twins’ nursery that was designed by Shannon. With a palette of creams, gold, silver, and rose gold, as well as stars and furs scattered throughout the room, the nursery was the embodiment of Shannon’s vision for the photoshoot. The twins were just beginning to nod off as we swaddled the two of them in soft pink and blue wraps. As we started the shoot, Oscar the cat slunk his way into the room. He sat patiently and watched us as we worked, keeping a watchful eye over his new roommates. Halfway though, Grandma popped in to see how her new grandchildren were doing, and found them fast asleep comfy in the fabric and fur that was their background. After finishing in the nursery, Shannon, Daryl, the twins, and even Oscar joined us in Mom and Dad’s room. The family piled onto the bed and snuggled close, again surrounded in the pinks and creams that Shannon so thoughtfully decorated with. The results reflect the warmth and love found in their home. Congratulations Shannon and Daryl on your growing family!